In roughly one year, Nate Shivers become a very public figure at the forefront of this growing niche hobby. Host of the prolific Coast 2 Coast Pinball podcast, Mr. Shivers ignored the “One A Month, And Only If We Feel Like It” schedule of most pinball podcasts, and decided to record when news broke and when his schedule allowed…which turned out to be quite frequently. At his peak, he records three 45-minute shows per week. At publishing, Shivers is just sixteen episodes shy of an even hundred, and has done so in just about 52 weeks. You do the math. Based in San Diego, California, Shivers is a travelling guitar salesman (sounds like a job your grandpa should’ve had) and uses his frequent travel to hit pinball hot spots across the country, like Modern Pinball in NYC and the Silver Ball Museum in Asbury Park, and attend high status pinball shows, like the Midwest Gaming Classic and the Texas Pinball Festival. He has scored interviews with nearly every boutique manufacturer in the industry and even Gary Stern himself, but the heart of his show lies in the one-man opinion/commentary format the show usually follows. No matter, you can expect Mr. Shivers to consistently deliver a show with interesting content and high production values, whether he is recording from the comfort of his San Diego home or from a hotel in Syracuse, NY. He has a lot to say about pinball, and it seems we, the community, are eager to listen. I was lucky enough to be able to exchange e-mail correspondence with Nate earlier in the week, and conduct a brief interview with him. Credit Dot: Coast 2 Coast Pinball isn’t your first foray into the podcast arena. You have alluded to it on past episodes, but what is your history with the medium? Nate Shivers: I had a podcast in the early to mid 2000’s called ‘The Tin Can’ with a friend of mine. I was living in the Baltimore area, and he was in Texas. It was just a general topic/comedy type show that we started out of boredom. We did a weekly episode on and off for a couple years. I also did college radio at Arizona State, so I have always been drawn to the radio/podcast world. CD: I’m assuming Clay Harrell’s TOPcast was a big influence? NS: I have listened to every TOP episode. I love hearing the history of the hobby from the designers. The early shows are not as compelling to me, as they really go down the rabbit hole of tech/repair which is not my forte, but I love that they were doing the show LIVE, and taking calls. You have to have an amazing amount of knowledge to field tech questions on the fly and actually be able to answer them right away. Clay is amazing like that. CD: Are there any other figures inside or outside of the hobby that influenced what you were trying to do with Coast2Coast? NS: The show is called “Coast 2 Coast Pinball” as a tip of the hat to Coast 2 Coast AM which was hosted for years by Art Bell and now by Greg Noory. It is a syndicated radio show that I grew up listening to late at night on AM radio when my family would go on road trips or I would travel with my dad. The show focuses on the paranormal, extraterrestrial life, and other “strange” topics, and I just love it. Art Bell was my favorite, and I loved his rapport with his listeners. CD: I’m not an expert in this area by any means, but what is your hardware/software setup like for recording? NS: More basic than most think… I use Reaper as the software, and either a nice condenser mic or a headset type mic when I am travelling. A little post editing with compression, eq, and reverb… That’s about it. CD: I have chosen to “write”, while you have chosen to “record”. What are the similarities/ differences advantages/disadvantages between the two opinion mediums? NS: I can just run my mouth for hours on end… It flows very easy. When I write, I tend to go back and edit over and over, which slows me down. I love podcasts as I can multitask with them… I can drive and listen, work on a pinball machine and listen, etc. I don’t have tons of time to just sit and read right now. I think writing may stand the test of time a bit better. When you do a podcast, you can easily date yourself. CD: In the show, you refer to your “notes”. Are these pen and paper notes in a notebook? What are the advantages to using this medium to shape your thoughts? NS: I have this college ruled composition notebook that acts as my “notes” for C2C. The first 40-50 episodes each have two full pages of notes… tons of writing, mostly hard to even read… but I wanted to be super prepared. As the show has started to cover more news, and my travels, I have leaned on the notebook a lot less. I still write the episode number on top of a new page every time, but some pages are totally blank, as I don’t need notes to talk about things as they are happening. Some episodes, especially when I go deep into a production year or a specific game are just wall to wall ink… as I need all the info right there. CD: Start to finish, how long does it take you to produce one 45-minute episode? NS: Notes can pile up for a day or a week… just random thoughts or bullet points I want to remember to touch on. Then I can bang out and episode from my first mic check to the upload of the podcast in about 2 hours. Sometimes I will spend longer on some dumb comedy attempt for the end of a show than it took to record the whole show. I thought it was very important from the start that the recording/editing process be as turn-key as possible, that way I could do shows really whenever I had something to cover. CD: You introduced your podcast into an already crowded field, with shows like the Pinball Podcast and Spooky Pinball dominating the landscape. Were the formats of existing podcasts influential in the approach you took? What sets Coast2Coast apart from the rest? NS: All I knew for sure when I started episode 1, was that I wanted a show that was shorter than what was out there, and that could be done multiple times a week. I personally don’t mind the long formats that others use on a monthly basis, but I knew I couldn’t do a 2+ hour show more than a few times a month, and it wouldn’t be as likely that someone would listen to a complete show if it was really long. I also wanted to cover news, happenings, and events as they happened, and not a monthly overview, which also just felt better in a 45 minute show. Some weeks I have done 3 shows, sometimes one show in 10 days. Not having a co-host or anyone else adding content has made that possible. I also worry sometimes that people will just get sick of one dude talking and talking and talking about the same stuff all the time… but so far, so good. CD: There seems to be a real camaraderie between pinball podcasters. Is there a competitive spirit between you guys or is it all hugs and rainbows as it appears? NS: I think everyone wants a bigger, more exciting pinball universe. So in that regard, I think it behooves all of us doing a podcast or a website or a blog to support each other and help our listeners find the other people adding content to the pinball hobby. I am sure there is a bit of a competitive vibe here and there… Anyone who keeps a show going for more than a few months, must want to be good, and do better work each time out, so you naturally listen to others and compare a bit. Luckily, it’s only pinball, and we are all just doing this for the fun of it, and nobody’s livelihood depends on their podcast. CD: How much of a fanboy were you when you got to talk to industry heavyweights Gary Stern and John Popadiuk? NS: Hmm. I respect these guys a ton. I appreciate their work immensely, but having worked in the guitar business for all these years, and meeting some of my childhood heroes in a work setting has really mellowed me out on the “fanboy” front. Gary Stern reminds me of Hartley Peavey the owner of Peavey Electronics… very similar in personality and demeanor. He is a businessman. The designers are much more like artists or musicians, and when you meet a guy who ends up being a really NICE guy, or seems to still be excited about the whole thing, like a Popaduik, or a Steve Ritchie, it really makes you feel good about pinball in general. 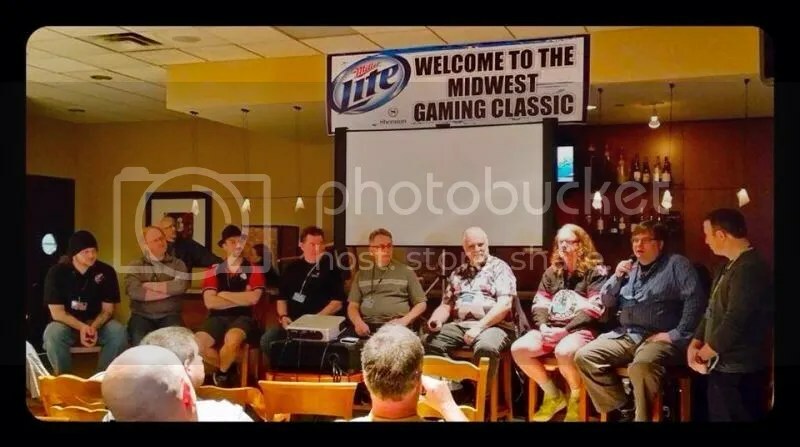 Nate with some legendary pinball designers at this year’s MGC. CD: With such high volume output, trying not to burn out or get sour on the hobby must be a real challenge. How do you combat that? NS: It is such a source of joy and fun for me. I am a huge music/guitar guy at heart, but I have worked in that industry for the past 17 years! I wouldn’t say I have burnt out or soured on guitars, but I certainly don’t go visit music stores when on vacation! Pinball is still mysterious and exciting. I meet guys who are selling their collections off because they bought everything they wanted and it just doesn’t have the “shine” like it used to. I am in no danger of that. When I travel and see a machine lit up waiting to be played I still get into it. There are always games to try and buy.. games to fix up, and thankfully new games being designed and released! This hobby is filled with 99% good people, and that makes it very easy to stay motivated to contribute. CD: What are the challenges in balancing work and home life with your high output podcast? NS: Sometimes I just have to tell Theresa, “Doing a show tonight”… She gets it. She knows it is a creative outlet for me. I have played in bands since I was 12, and don’t now… So I need this show! Work is the tough one. We have times in the year when I am just slammed all day long, stay late in the office and getting ready for a road trip, and just don’t have the energy to record… But I get out on that road trip, and the quiet, sometimes lonely hotel room provides a fantastic place to get a new episode going. CD: Your wife Theresa makes frequent appearances on the show, and is met with tons of positive feedback. Why is Theresa such a popular component of the show? NS: Obviously this is a male heavy hobby. Many of us have tried with varying degrees of success to get the women in our lives into pinball. Theresa loves it… and she is a total performer and knows how to play a great role on the show. She is funny, smart, and gorgeous… so that all helps. I have had more than one email about how jealous a guy is that I have a girl in my life like Theresa who embraces pinball and enjoys it too. CD: I had the idea a to do a “Pinball Wives” interview series. Perhaps we could glean more information about ourselves and our “collecting disease” if we talked to hobby outsiders that have to put up with it every day of their lives. What do you think? CD: On the heels of a rather nasty, and completely unwarranted, post on Pinside by a classless troll looking to incite a war of words with you, can you share a few thoughts or feelings about being a public figure in this niche hobby, and the challenges/opportunities that it brings? I guess you have become one of those “pinball celebrities” I was asking about earlier? NS: Loved it. For anyone to spend that much energy and effort to try and bring me down… I must have struck a nerve somehow. Likely it is jealousy, or insecurity on someone’s part that they themselves aren’t happy with where their life is right now, which is pretty sad, but I would rather incite a troll here or there than be totally ignored. Now, if someone ever said that to my face, you know, not behind the great protective curtain of Internet anonymity… we would have a situation. It has been a bit of a trip to have people just walk up to me at shows or arcades and know so much about me, but that is part of the experience of a long term listener to any thing like a podcast or a radio show… You get to know the person behind the mic. I feel the same way with certain authors, fellow podcasters, etc… I think people quickly realize how boring I am, and we just play some pinball. CD: Speaking of Pinside, how active are you on the forum? It is an extremely helpful tool to connect the community but can also be a frustrating experience due to a handful of unsavoury characters. What are your thoughts? NS: Yeah, the Internet is full of people looking for attention… I don’t take much notice. A guy like Lloyd the Great does more good in one day than any troll can do in a month, so it all works out. Donate to Pinside! CD: Your “catalogue” of recordings may seem daunting to someone who has never listened before. Other than picking the newest episode and working back, can you share a few episodes that would serve as a good “jumping off” point for new listeners? CD: What are your favourite episodes that you have recorded thus far? NS: I like the Texas Pinball Festival, the Midwest Gaming Classic, and then probably the Twilight Zone special of Episode 50 and the stuff on the Medieval Madness remake. I have never gone back and listened to an entire show myself, but those were the episodes I liked doing the most. CD: Can you share some listener stats? How many average downloads per day do you get? What was your most downloaded episode? NS: It’s a funny thing… The show has 3 main avenues for listeners… Direct from my podcast host, which I can track, Stitcher Radio, which I can track, and then the big unknown factor is Itunes… More people tell me that they listen on Itunes than the other two platforms… and I can’t track podcast plays/downloads on Itunes… so the total listener-ship is likely bigger than I realize. The Josh Sharpe interview was the most downloaded until the Midwest Gaming Classic shows. Looks like the interview with Clay Harrell will be the most downloaded if it isn’t already. CD: What are your thoughts on the future of the hobby? Where will we be in five or ten years? NS: I see it continuing to grow. A lot of people who grew up loving pinball, like myself are now settling down, buying houses, making better money and remembering their love of the game. Prices on older games seem to be normalizing a bit, and the new games coming out of late are excellent. Better local clubs and groups are going to help drive the location aspect, and obviously the “Barcade” scene is hot now. I don’t see pinball getting back to the levels of the two or three golden ages we have seen, but as more games move to the home buyer, I think that is okay. CD: It is well documented that Twilight Zone is your desert island game, so I can’t ask the typical “favourite game” question. In that case, maybe you could share a few games you have never played that really interest you. NS: I have played just about all the A and B list games, and I always seem to have one or two haunting my thoughts. Champion Pub is a game I want to own. I have a deeper love for Circus Voltaire now than ever before… As far as games I have actually never played…. Congo and Pinball Magic are the only two games in the Pinside top 100 that I cannot remember playing. So, that would be cool to do. Also, Big Bang Bar is sort of a thorn in my side, but I have a chance to play one coming up this summer! 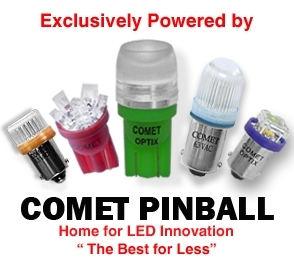 CD: To close out the questions, are there any future plans you can share about the direction of Coast2Coast Pinball? NS: More video. I would like to do a monthly Video show… sort of what PAPA is doing with their Road Show, but with my pace and vibe. I have other ideas for live shows, call in shows, etc… but time is always the problem. I would expect to be near 150 shows by the end of 2014… There are some interviews I have loosely lined up, and will probably get too this year. I hope to get to more and more pinball shows and expos. Hopefully I can keep getting better at the podcast, maybe expand the videos, and get a little bit more interesting website going. 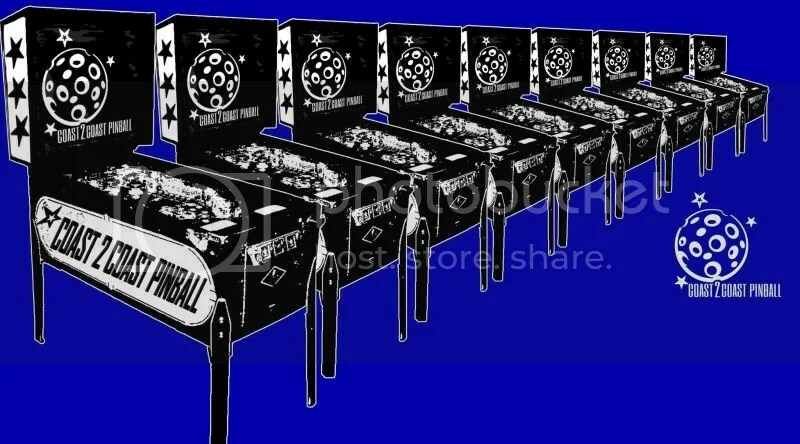 I have always wanted Coast 2 Coast Pinball to be my commentary on the hobby for the guys who love the game and spend their money owning/playing pinball. Catch Mr. Shivers doing his podcast thing over at Coast 2 Coast Pinball and be on the lookout for him at pinball venues and conventions across the continent! Categories: People | Tags: Clay Harrell, Coast2Coast, Man Out of Quarters, Nate Shivers, Pinball, Podcast, TOPcast, Twilight Zone | Permalink. Nice article… Coast 2 Coast is a great podcast! Nice interview. I find it amusing how many people like Nate (or Clay, or Charlie) find it hard to talk about themselves after spending so long as the voice of something. I have fixed the errors you have “eluded” to. My “copyediting” is probably unprofessional and annoying to the reader who can pick up on such things. I can’t guarantee it won’t happen again, but I can promise to work on it. Thanks for the comments.